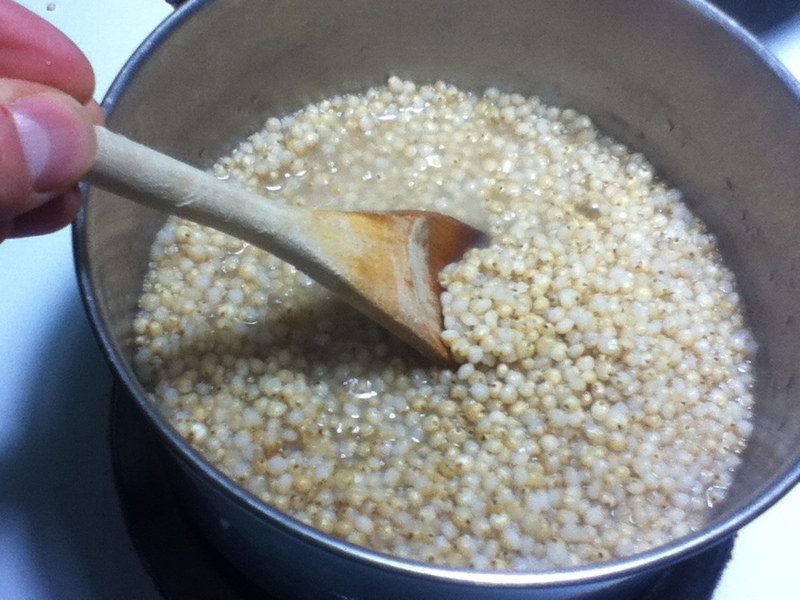 New to Me- Sorghum | Food It Yourself! I like to think I am an adventurous person when it comes to food, but I realized recently that I have not tried a new food in…WOW! I don’t know how long. I made up my mind to try a new food. Believe it or not, I found a new food I like at a regular grocery store. Near the pasta, rice, and corn meal I found a reasonably priced bag of sorghum. What is sorghum? It is the 5th most important cereal grain cultivated by the human race. It was collected in Egypt 8,000 years ago, was domesticated in Ethiopia and Sudan, and then dispersed by traders all along the Silk Road. The Whole Grains Counsel has a great write up about the history and use of this grain. There also may be some serious health benefits to eating sorghum. I tried two basic preparations for this grain, both from the back of the package. First, I tried popped sorghum. It is made just like popcorn- grains go into a pan with a lid and get heated while you shake it. When the noise dies down you have a whole grain snack that looks a lot like popcorn, but very, very tiny. Mr. Food It Yourself declared the popped grains “adorable”. 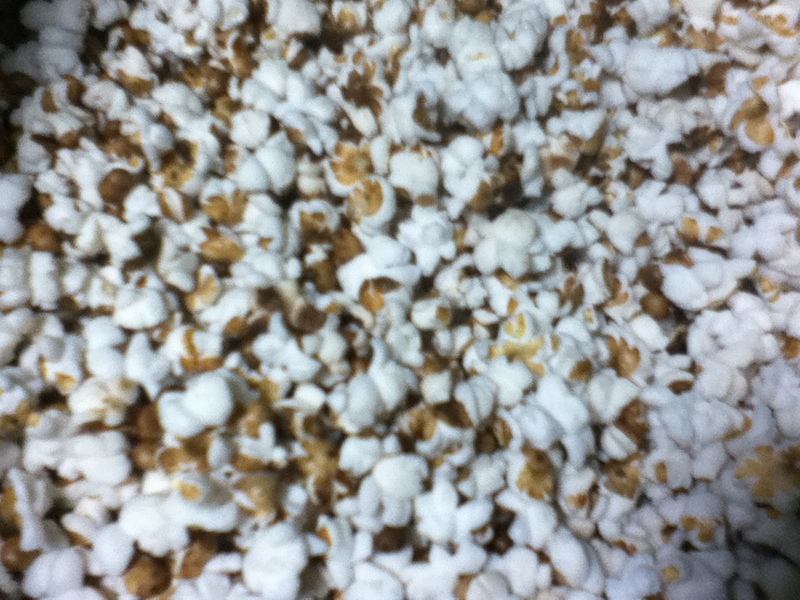 Looks like popcorn, but it isn’t! This is not a quick cooking grain- it took a little over an hour. Totally worth it, though. Next, I tried sorghum cooked in liquid. By volume, it takes three parts liquid to one part sorghum. I cooked with plain water so I could taste the grain but broth would work well, also. The same sweet smell wafted from the pot while it cooked. After draining the extra water as the instructions directed I took a taste. The grains have a satisfying chewiness that rice lacks. 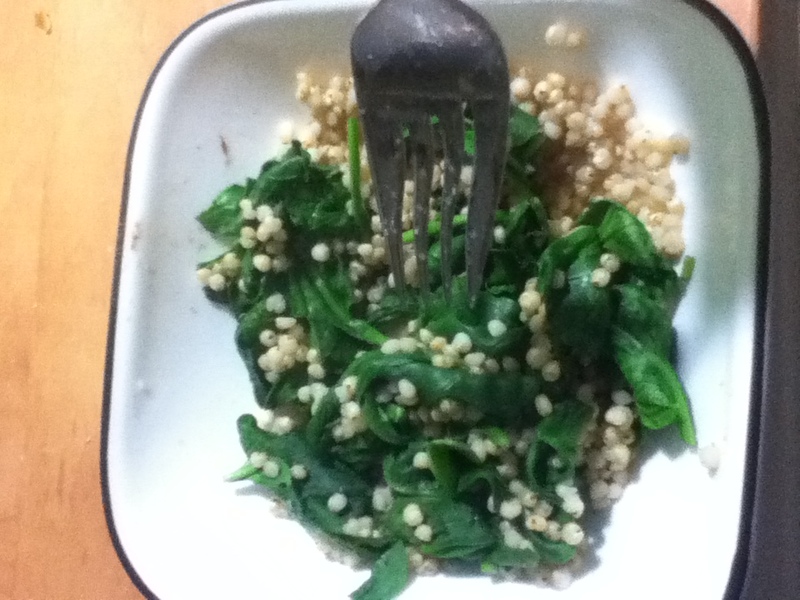 I added a handful of fresh spinach, a pinch of salt and a dash of curry powder to make a comforting bowl of dinner. So, that was my adventure with sorghum. I still have most of the bag left, so there will be more experiments in the future. I am on the look out for recipes, but I may just play around. Sweet winter vegetables like butternut squash and carrot would probably go well with this grain. I might try re-heating some for breakfast with apples and cinnamon. Are you ever tempted by unfamiliar ingredients at the supermarket? Give one a try! You just might find a new addition to your DIYet.